Every film by Collective Development Incorporated, a feature-film production company based in Lansing, Mich., is, in its own unique way, a direct reflection on the organization's name and the artists in front of and behind the camera on each project. LANSING, Mich. - May 12, 2017 - PRLog -- Film making is one of the most highly collaborative endeavors in the art world. And nothing defines 'Collective' more than a group of people 'Developing' something of merit for the screen and then seeing it embraced by audiences and peers alike. The ICFF, which received more than 500 worldwide entries this year in categories for features, shorts, documentaries, music videos, animated films and student films, is the only Christian film festival to have a film screen in France at the world-renowned Cannes Film Festival. "We were nominated for four awards," said DJ Perry, CDI's CEO (and who portrays Jesus). "But this nomination was the one I wanted to see us win." Forty Nights was also nominated for Best Picture, Best Original Score (by sound designer/composer Dennis Therrian) and Best Lead Actor (for Rance Howard, who portrayed the 'Devil as an Old Man'). "Our goal always is to inspire people with our story telling," added Co-Producer Anthony Hornus. "And this award represents all the artists. Working together, they created a film that was acknowledged at this major film festival as being the Most Inspirational." One of the film's Executive Producers, actress and philanthropist Rebecca Lawlor of Hampton, VA., accepted the award on behalf of CDI. "We are blessed to have been nominated among so many other beautiful and important works," said Ms. Lawlor. "We thank the International Christian Film Festival for honoring our work." 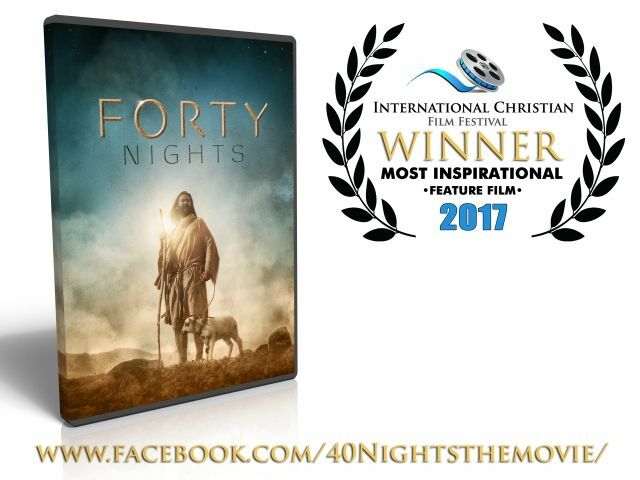 'Forty Nights' is billed by its distributor, Bridgestone Multi-Media Group (BMG), as 'An in-depth character story filled with simplistic clarity and truth about one of the most known, questioned and mysterious figures in human history. Beginning with the baptism of Jesus by John the Baptist and taking the story through his quest into the wilderness, where Jesus reflects upon his upbringing and the events that shaped his life, Forty Nights vividly portrays his temptation by the Devil in a forbidding land where he must strengthen himself for the real journey that lies ahead." An interesting aspect of Forty Nights, and an homage of sorts, is that the late Hollywood actor Dan Haggerty (TV's Grizzly Adams) gave his final 'performance' of a long, storied career, by voicing 'God' in the film. Mr. Haggerty had performed in other CDI films throughout the years. "Again, so proud of our team," said Perry, who penned all three films in the trilogy. "The ICFF, even though we have pre-distribution on our films, has already told us they want both 'Chasing the Star' and 'The Christ Slayer' as they come out. 'Chasing the Star,' directed by Bret Miller, is concluding a month-long Michigan theatrical run in Grand Rapids, Lansing and Detroit, and will be released nationally on Sept. 5 to home DVD, VOD and streaming services. 'The Christ Slayer,' directed by Nathaniel Nose, recently completed Principal Photography in Yuma, AZ. (where the majority of all three films were shot) and will be released in early 2018. Co-Producer Melissa Anschutz, "Given the mass amount of people he (Jesus) inspired, for us to be given this particular award, it is received with a true humbled honor"